While heading to Kenya, I knew that I needed to pack very lightly. Because I had 3 layovers on the way, I didn’t want to risk my bags being lost so it was best for me to take two carry-ons. This leads me to the Eagle Creek Packing Cubes. OMG! Let me tell you how easy they made my life while in Kenya. They kept me super organized the whole trip. I had safari clothes in one, city clothes in another, and then things to sleep in and undergarments. I could literally pull the days clothes out swiftly and not disrupt the flow. They are soft so it’s super pliable and you can really stuff things in there well. I rolled my clothing first to make it easier. Some of them are ventilated and you can see through them so you already know which one to look through at a glance. When I had enough dirty clothes, I transferred them all to one bag and then moved all clean clothes to one. At one point at the end of the trip – I guess I didn’t do a great job of getting the most space out of them on the way and I was actually able to eliminate 3 of the packing cubes by consolidating. Now I know how to properly put stuff in there and I know how much it can take. This mostly popped up with my cubes with toiletries in them. The entire trip I hadn’t felt like I lost anything like I generally do when I just pack stuff all around my bag. Everything was still organized in the end which eliminated the need to constantly look for things or wander if I lost something. My bag stayed nice and organized the entire time, including moving through 3 different hotels. When it was time to pack to get ready, I really had nothing to do, It was already done and eliminated the need to have to keep going back to repurpose and refold. This was the first trip I felt organized and didn’t have to panic while packing my bags to make sure everything fits well. I can only imagine how awesome they would be with shorter trips too. Organization + easy packing life is what I am about! 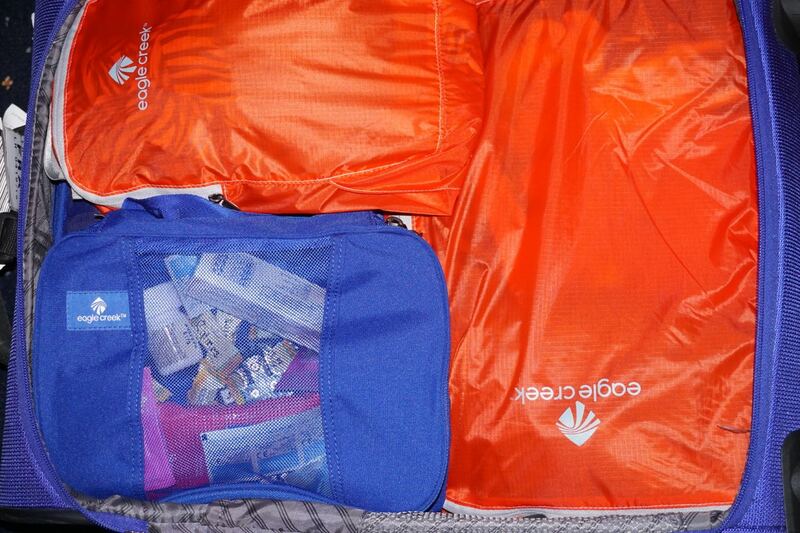 Check out some Eagle Creek packing cubes.